Picture Books, Doodles, and Fish….Oh My! Hello everyone! I know that is one of the lamest titles ever, but it’s early, it has been a long week, and honestly, I couldn’t think of anything better! 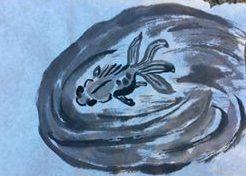 I just wanted to share that I have been practicing painting with my Chinese brushes and ink. I did these doodles last week, but after the long drive to Walnut Creek for the Picture Book workshop, I was pretty messed up physically for a few days. I haven’t been like that in quite a while….long enough to have forgotten what it was like. My back was really sore, and my arm is still sore from all of the internet stuff I did on Sunday, the day after the workshop, but getting better. (A slap to the forehead) I knew better, but I had blogging and Facebook stuff to do!! I have been able to work out a few times this week which always helps! I know some of you are interested in hearing about the picture book workshop. Unfortunately, it turned out to be somewhat disappointing to me. To be fair the two people who put it on had never done a workshop before or worked together, but they were very entertaining and nice. However, most of the information they gave I had already been reading about in books about the picture book publishing industry. The workshop was supposed to include some hands-on exercises in actually working on the structure of picture books, so I was hoping for some feedback on what I had been working on which I took with me, but that didn’t happen. Again, though, to be fair it was only a 3 hour workshop so there really wasn’t enough time. Afterwards, though, my husband and I went out to dinner with our friends Steve and Tania who stood up for us in our wedding which was small (almost 22 years ago!) We only wanted a best man and a maid of honor. We had not seen them in at least seven years or been to that area since then. After the workshop but before dinner, we drove by my parents’ old house which looked okay. Then we drove out to the cemetery where they are buried, and that felt sad and weird. I talk to them all the time so it wasn’t too devastating to visit their graves. I still cried a little, though. I really miss them. 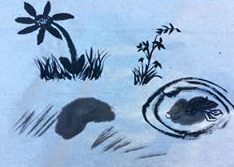 So on a happier note…here are more of my attempts at learning Chinese Brush Painting. I was just playing (which is always fun) and practicing leaf and grass strokes. Also, in the first photo you can see I tried to do another goldfish, but I had too much water in my brush so it turned out to be “The Blob” with fins! I am not sure what kind of flower that is, so you can call it whatever you want! The small leaves and stems are supposed to be more bamboo. Hmmm…. It was fun, and that’s all that matters! So I grabbed another sheet of the rice paper I used for these. It tends to curl up a little more than watercolor paper that hasn’t been stretched first. So I am not sure I like it much, but I still plan to use it for practice. So here is “Sammy” the Goldfish. I just felt he needed a name. 😉 His eyes are pretty big. Perhaps he sees some food he’s going to go after! Tomorrow I will be posting the second watercolor painting I did with my Chinese brushes. It includes a waterfall and my first attempt at doing a Stickleback fish! The fish turned out too big proportionally for fitting into the rest of the picture, but I like the waterfall so I want to share it! I am planning to do a much bigger Stickleback fish for my friend, Derrick. Hello friends! It has been too long since I have been able to post anything due to “technical difficulties.” However, in the meantime I was working a few things. This is Larry, the Leatherback sea turtle done in Eric Carle’s style of art. This was difficult to say the least. I tried painting plain white tissue paper with acrylic paint, but found that the tissue paper I have was too thin or so I thought. Now, looking back, I think the paint I mixed was too thick. So I switched to using tracing paper instead. I like the texture of it more, but since I had my pain mixed already, I still used it. And….I still think it was too thick. However, I plunged ahead, painted a piece, light gray, one dark gray, one pink, and one blue. Next I laid those pieces onto the different colors of painted paper and drew around the image like a stencil and cut those out. Then I traced the whole image onto a piece of poster board. The last couple of steps were the most time-consuming. I had to glue down the colored pieces cutting the painted paper to precisely fit the image. I had to conform the blue pieces to fit around the image for the water. Lastly I added Larry’s features with black paint and used the paper that was already painted white to cut out and glue down his spots. I think I went through more steps than Eric Carle did in his art process, but I learned from my mistakes…..I think. I am not sure if I will try it again, but I may do another image in his style eventually. It is not something I would choose to do all the time, that’s for sure! All I know is that man must have had an amazing amount of patience! However, I do like the way Larry turned out. The part of the painting that is my favorite is the water, though. Well…maybe his eye, too. Hello friends. Today I found a great video of Eric Carle talking about his work and a special treat during his talk is that he reads a few excerpts from “The Very Hungry Caterpillar.” I had never heard of this book until I went to college at 30 years old. In fact it wasn’t until about a year or so after that when I began taking Child Development classes and working in the Child Study Center at Los Medanos College in Pittsburg, California, that I heard this book read aloud by one of the staff instructors. From then on I was hooked on Eric Carle. When my first child was about a year or less old in 1997, I began reading him this book. I also read two other books to him by Bill Martin, Jr. that Eric Carle illustrated called “Brown Bear, Brown Bear, What Do You See?” and “Polar Bear, Polar Bear, What Do you Hear?” But the one that Eric Carle wrote and illustrated that my son still remembers that he loved was “The Very Busy Spider.” I have board books of all of these except The Very Hungry Caterpillar. I have a larger picture book of that one! When I was still in college I also took a short-term class with Ed Lewis who was one of the main Child Development instructors called Story-Telling. He taught us how to tell a story as you read it, but also how to tell a story without reading a book. I was single without kids at the time so it was pretty challenging for me. I had never really read books to any kids at that point, but once I had my first child, it came easily. Fortunately, even as a toddler he loved to sit and listen to books. He even began using the excuse “read another story!” to stay up longer! And to this day he still loves to read and is a writer himself. I am proud of him needless to say. Well, I didn’t plan to write so much about myself, but I want to share this video of Eric Carle because you will not only get to hear his faint German accent, since that’s where he grew up as a young child before coming to America, but you’ll get to see a glimpse of the process of how he does his art. He paints white tissue paper with acrylics in all kinds of ways, draws his characters, then cuts and pastes each piece to the drawing. It is pretty tedious but amazing! I love his art very much. In fact I checked out his book called “The Art of Eric Carle” published in 1996 from the library a while back and then had to buy a copy, because I want to be able to read it again. What I loved about it most is the middle of the book! It has two fold out pages that show him creating his caterpillar step-by-step and a picture of his art studio. Very amazing indeed! Soon I am planning to do a little art Eric Carle style just to go through the process. I know myself, though. It will probably feel much too time-consuming to me, but watch for something soon! In the meantime enjoy these videos! The first one is of Eric Carle. Also, if you have time, the second one is a video I stumbled onto of a live presentation of the story of The Very Hungry Caterpillar by some children from Woodhaven, Queens, NY, who made this video through their local library. It’s adorable!